In recent years, professional services providers have had to rethink their sales methods and adapt to profound changes in the way clients buy services. 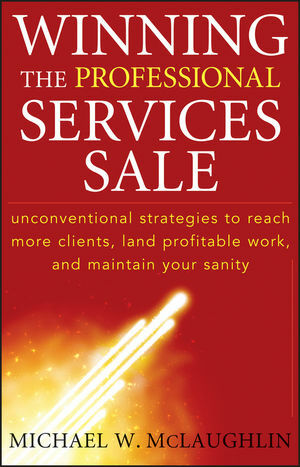 In response, Winning the Professional Services Sale argues for fundamental changes in the seller's mindset and sales strategies. Rather than pressing the sale, salespeople must help clients buy--the way that works best for each client. This new approach gives buyers what they now want in a services seller: a consultative problem solver, change agent, and solution integrator, all rolled into one. Author Michael McLaughlin presents a strategy for winning new business with a holistic approach to each client relationship. Only by fully understanding a sale from every angle, including its impact on the client's business and career, can salespeople thrive in the new era of the service economy. Michael W. McLaughlin is a management consultant and speaker with more than twenty years in the professional services industry. He is the founder and a principal of MindShare Consulting, LLC, which helps professional services organizations design winning approaches for sales, marketing, and service delivery. For more information, please visit www.MindShareConsulting.com.